An estimated one out of every four women of childbearing age has fibroids. Many suffer quietly from its symptoms, while others have no symptoms at all. In fact, it is estimated that as many as 77 percents of women of childbearing age could have uterus fibroids without knowing it. Uterine fibroid tumors vary in sizes and numbers and because of that, the symptoms of those fibroids can range from uncomfortable to extreme discomfort and pain. There are many treatments out there, but some do very little while others aggravate the situation even more. The truth is, treatments such as birth control pills, just mask the problem. What you need is something to get rid of the underlying fibroids for good so you can free yourself of fibroid pain forever. tumour = is simply a mass of tissue that appears as a lump in the body. cysts = is an encapsulated closed sac that may contain fluids, semi-solid substances or gas. Submucosal. Submucosal Fibroids can grow inside the lining of the uterus and protrude inward. These cause heavy bleeding and prolonged periods. Intramural. Intramural Fibroid can be located in the wall of the uterus and are the most common type of fibroids. They cause the uterine to become enlarged, and can cause pelvic pain, heavy menstrual bleeding, pelvic or back pain, and pressure. Subserosal. 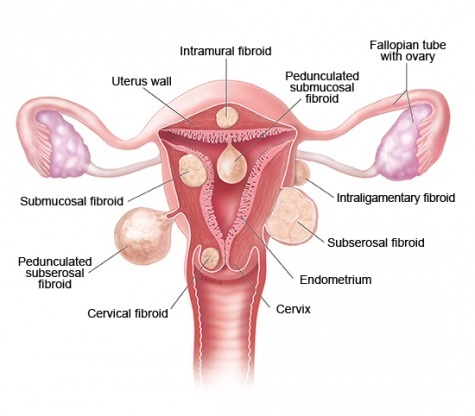 Subserosal Fibroids are located outside of the lining of the uterus and protrude outward. May cause back pain or pressure. The subserosal fibroid can also grow on a stalk attached to the uterus, in which case it is called ‘pendunculated.’ The stalk may become twisted and can cause severe pelvic pain. Age. Women between 30s and 50s all the way through menopause. Fibroids usually shrink after menopause. Obesity. For very obese women the risk is two to three times greater than the average. Family history. If a woman’s mother had fibroids, her risk of having them is about three times higher than the average. Ethnic origin. African-American women are more likely to develop fibroids than women of other ethnicity. Eating habits. Eating a lot of red meat (e.g. beef) and preserved meats like ham is linked with a higher risk of fibroids. With the alarming number of women having uterine fibroids, it begs to ask how this issue can affect pregnancy. Though fibroids don’t usually interfere with conception and pregnancy, there are concerns you should know about to help your chances of getting pregnant or prevent complications in the process. First of all, it is possible that fibroids could distort or block your fallopian tubes and prevent the passage of sperms from your cervix to your fallopian tubes. Fibroids can also distort the shape of your uterine. Submucosal fibroids may prevent implantation and growth of an embryo. In these cases, doctors may recommend you remove the fibroids before attempting pregnancy.